I was highly excited about making it here, after all the messing about travelling to Colombo for a permit, waiting a week for that permit and then spending a night on a bus, and it didn’t disappoint. Coming here was definitely the highlight of my trip to Sri Lanka, but I was also saddened by some of the things I saw and heard. Jaffna has been fought over many times. It was occupied by the Portugese in 1619, later captured by the Dutch and then taken over by the British in 1796. During the colonial period it was Sri Lanka’s second largest city and the people who lived there, the majority of whom were Tamils, were known to be highly educated and cultivated. After the outbreak of civil war, the city was occupied by the Liberation Tigers of Tamil Eelam (LTTE) in 1986, and from 1989 to 1995. 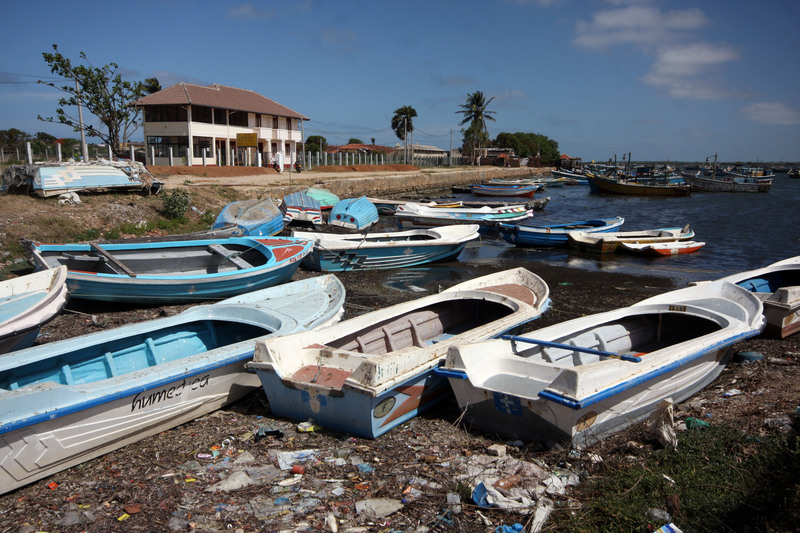 Jaffna was the scene of much fierce fighting but came nominally under the control of government forces in 1995. Many of the Tamils in Jaffna, however, covertly supported the LTTE. Fighting on the Jaffna peninsula went on for many years longer, at least up until 2006, when the LTTE launched an attack on the key Sri Lankan military airbase at Palai. Since the city has been in government hands for fifteen years, I was surprised that more had not been done to rebuild the many ruins that still remain from all the fighting. The former government district of Bankshall St, Western Main St and the Cross streets between them are full of crumbling remains of once fine buildings, but there are ruins all over the city. Several of these ruins are actually inhabited. On Kandy Rd there’s a former kachcheri (administrative building) that’s been severely damaged by bullets and shrapnel. Both within Jaffna itself and throughout the surrounding district, there are soldiers guarding literally every junction. In spite of that the city feels remarkably free of tension, although I don’t think people felt able to speak too openly about the situation. Almost everyone I met, including the Sinhalese soldiers, was unfailingly friendly, helpful and curious, waving at me and saying ‘Hello’, ‘Good morning’ or ‘Good afternoon.’ It was a low season for tourism anyway but in Jaffna I met only two other foreigners the whole week I stayed there, and that’s because I deliberately went looking for them in Morgan’s bar. On my first day I simply walked around the streets. The first thing I noticed was there was none of the usual hassle from three-wheeler drivers. I passed whole groups of them but they didn’t even shout ‘taxi, madam!’ at me, much less start up their vehicles and buzz around me like giant flies, as they do in Colombo. In St Martin’s Seminary some trainee priests were playing loud hip hop music on professional turntables set up in the chapel! Other boys stood reading the newspapers. Along Martyn Rd a large group of ladies was holding some kind of Christian celebration and several courteously asked me to sit down and join them, which I did for a few minutes. They spoke good English and told me to go and visit their church, St James’, which was nearby. 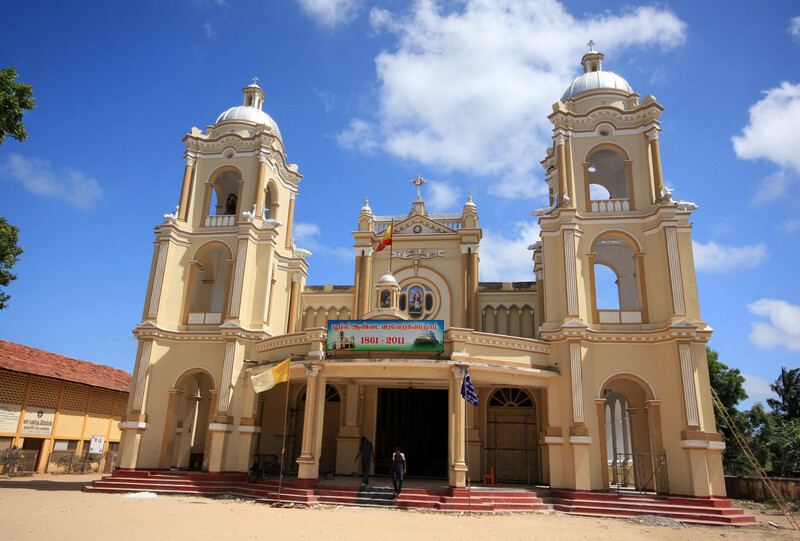 Jaffna has a lot of beautiful churches, both Catholic and Protestant, although the vast majority of the population is Hindu. 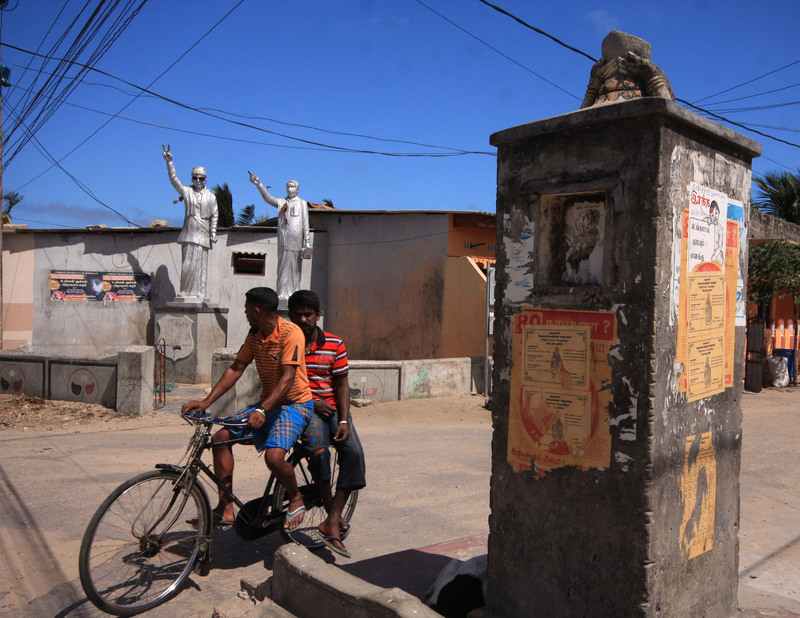 All Muslim residents were expelled by the LTTE in 1990, but they are have begun to return. Similarly the Sinhalese residents either fled or were forcibly expelled. For these religions, there is only the Jummah Mosque on Jummah Mosque lane, or the Sri Nagavihara International Buddhist Centre, on Stanley Rd. St James’s church is a large, grand building but it was undergoing renovation and was full of dust. I rested on one of the few pews and an old man leading a bible reading came over to me and asked me to take photographs of his group. He told me they met every week for a couple of hours. ‘Take pictures and tell people about us,’ he said, as if the city was still locked away from the outside world. Here, then, was still the war mentality, and it will be slow to change as long as the city remains occupied. I didn’t like to tell the old man that I doubted the world would be interested in his bible group, but I took some pretty dark (as in gloomy) photos anyway. On the other hand, the government is clearly aware of the situation and is making some effort to revitalise the area. For a start, the roads to the lagoon are now completely open, whereas two years ago the fishermen had to file through a checkpoint to reach their boats. A man wearing sunglasses was standing next to his 4×4 near the harbour and he told me he was part of a large team of people who intend to redevelop the entire area in the near future. On Beach road there’s the Martyr’s Monolith, which remembers 31 locals killed by the military in 1986, and also a weird statue of a man wearing dark glasses with one hand held aloft making a V sign. This is MGR (MG Ramachandran), a Tamil actor turned politician who gave the Tigers $4 million between 1984 and 1987. He’s standing next to a statue of someone else but the description on the plinth is in Tamil. The men on Beach road were fairly friendly, but there was more suspicion than on the main road and I felt it wouldn’t have taken much for them to turn hostile. Further north a girl appeared from one of the many ruined buildings, giggling and beckoning me to follow her inside. I didn’t feel a grain of hostility from her so I went in and was immediately surrounded by her sister and two brothers, all curious about me. They lived in this ruin with their mother and grandmother, and when I pointed out it didn’t have a roof they all laughed. Probably they’d made some kind of low shelter somewhere within. I passed two bullet-ridden headless statues on Main Rd, but I doubt they’ll be there for much longer. 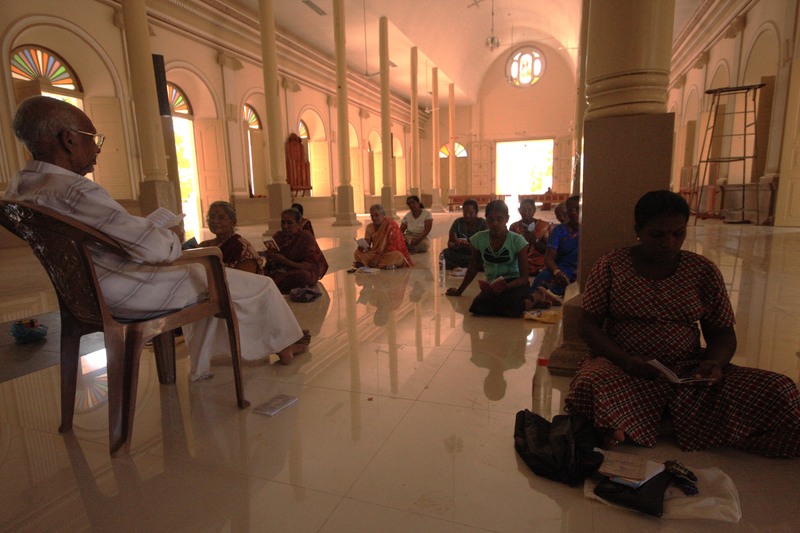 I began my second day with a visit to the Jaffna Public Library, www.jaffnalibrary.lk. This was top of my list because I knew it had huge significance for the Tamils, as a concrete symbol of their strong intellectual and cultural heritage. 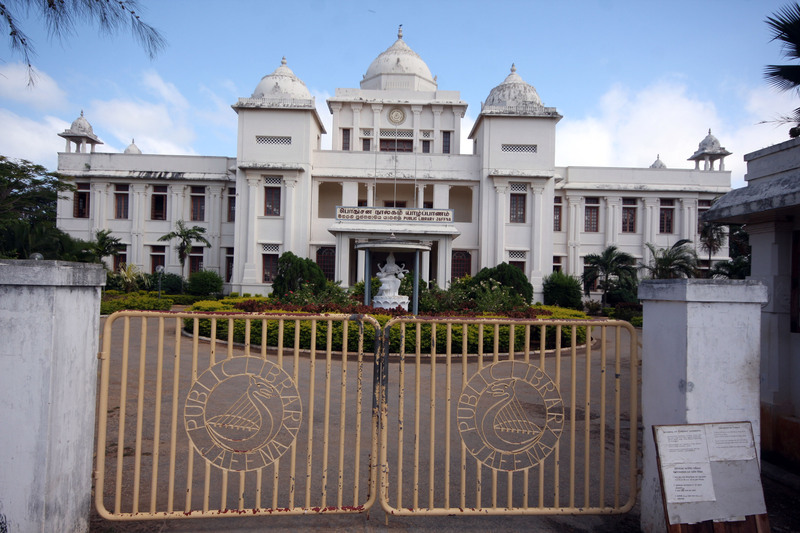 It was once thought to be the best library in south Asia, with a collection of over 97,000 books and many unique, archival palm-leaf manuscripts, but it was burnt down by an anti-Tamil mob in May 1981. This destruction was deemed to be an act of cultural genocide of the Tamils and was a significant rallying point in the build up to civil war. It was also a symbolic beginning to the decline in educational standards in Jaffna, which inevitably took place during the conflict. 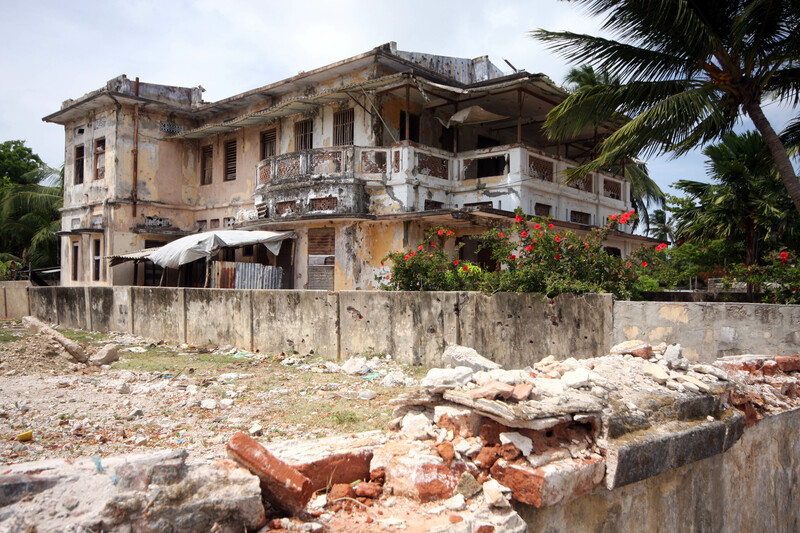 I would very much like to use your photo “57-ruined-house-on-first-cross-st-jaffna.jpg” in an articles about Sri Lanka in the forthcoming issue of DIE GAZETTE (http://www.gazette.de). Could you please allow me to do so? Unfortinately the magazine does not have any money to pay you. But I hope this no reason for you to say no. Yes by all means you can use my photo! All I ask is accreditation, and for it not to be used to back up anything blatantly false . I just checked out your magazine ( although I’m not sure Google translate does it justice) and it seems like an interesting, intelligent project. Please send me a link when the photo’s up, if you can remember. My email address is lucy_calder@yahoo.co.uk. Fascinating! I wish you had more photos of Jaffna! I want to go there some time cos my grandfather was born there!